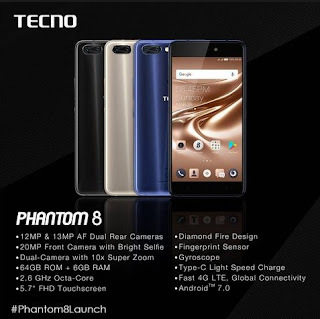 The TECNO Phantom 8 is a highly specced smartphone boasting 64GB with option to expand to up to 2TB using a micro SD card, just in case you require more storage space. The smartphone is a dual Micro SIM Android device and supports dual standby with 4G network option as expected. With that huge RAM size paireMediaTek Helio P25, an octa-core processor, running high task demanding apps wouldn’t pose a problem.